I know we say this every week and I wish I knew a better way to say it----but we have the BEST contestants and the BEST sew-alongers around. (It's seriously the truth.) The designs this season have been so creative so well done from everyone---that the judges keep commenting that their job is hard! 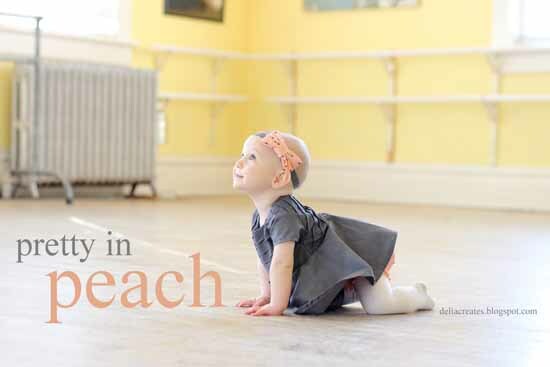 Delia with her Pretty in Peach is our designer winner! Congratulations Delia!! Wasn't her outfit so great? 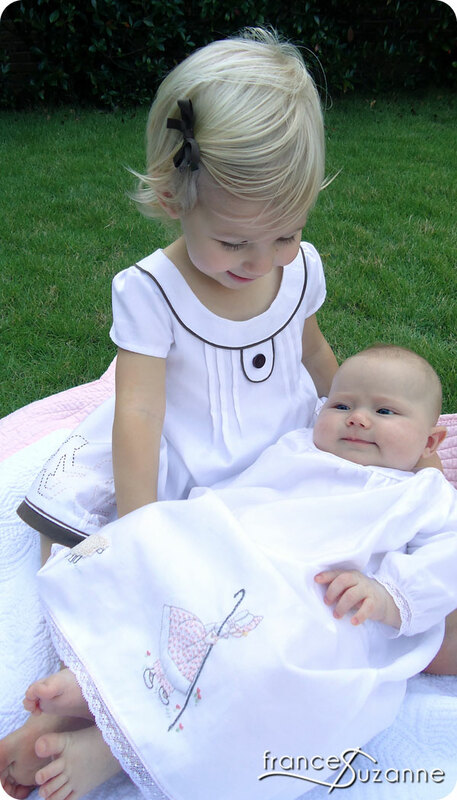 and Frances Suzanne's "Once Upon a Rhyme" outfits were the winning looks for our Sew Along Challenge at home. Congrats! 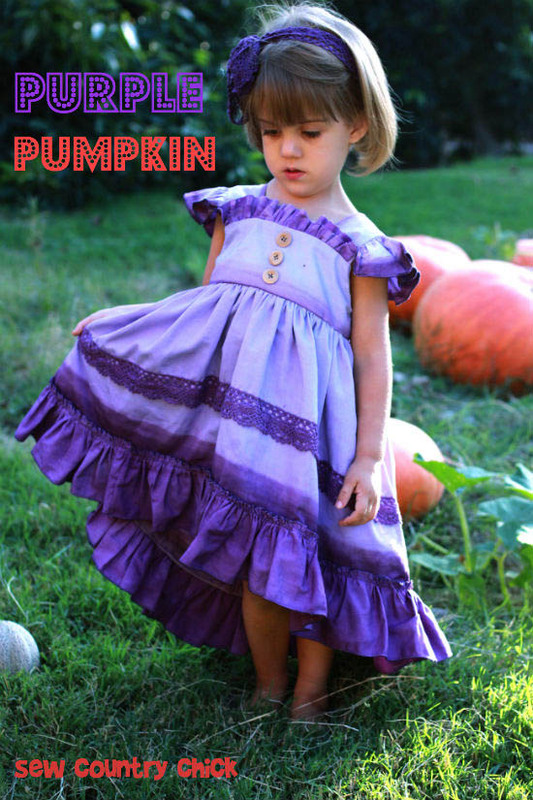 They will receive a $25 gift certificate to Sew Fresh Fabrics to buy some new lovely fabric! Thanks Sew Fresh Fabrics!!!! And sadly, we are losing one of our designer's ---- Justine from Sew Country Chick. We had the chance to meet Justine in person earlier this Spring.. and there is not a nicer, more talented seamstress out there. (And she's got great stories on her blog about Hollywood and costuming! They are so interesting...) Please head over there and show her some love! We are going to miss her around here...but she is going to be receiving a $25 gift certificate to Stitch Simple to buy some more fabric goodness for future projects! Thank you Stitch Simple! So get your minds thinking about boys' clothing....and get sewing! She was my absolutely favorite Sew-alonger - such beautiful outfits! You know, it just shows how tough this competition is when the person who we are saying "goodbye" to is as talented as Justine is. That purple dress is adorable. Congrats to the winners too! Great job. this is always my least favorite post, I hate saying good bye! Well done Justine! And congrats to Delia! Congrats to the winners! Lovely outfits. And I, too, hate to say goodbye to Justine, but will continue following all the wonderful happenings on her blog. Oh well, thanks everyone. It was fun. it's just as well I suppose because I was going to dress up Gigi as a boy this week and say she was Gigi's cousin Joey! And if any of you are interested in learning to make your own patterns stop by my pattern making draft a long and sew along in November. My Sign up post is up today. We are going to miss you Justine! Congrats Delia! WOW for the at home winner! I have to say that She should be in the competition! that outfit out did all the rest, i loved the others but wow wonderful job! Absolutely flattered to be chosen as the Project Run and Play's "Sew-Along Winner" for the week!! What an exciting day for us in our 'blogging infancy'... This challenge was our favorite, and we look forward to using the rest of our white sheet using ideas generated by the contestants and Flickr sew-along friends. Thank you so much! Justine, I will miss you!